Last month Shedding Light featured Barry Saltz, DDS, a long-time user of Enova Illumination LED surgical headlights. He passed the Enova torch to his son Adam Saltz, MPH, who hopes to enter a dental residency program next year, by giving him a new Cyclops XLT-125 headlight. 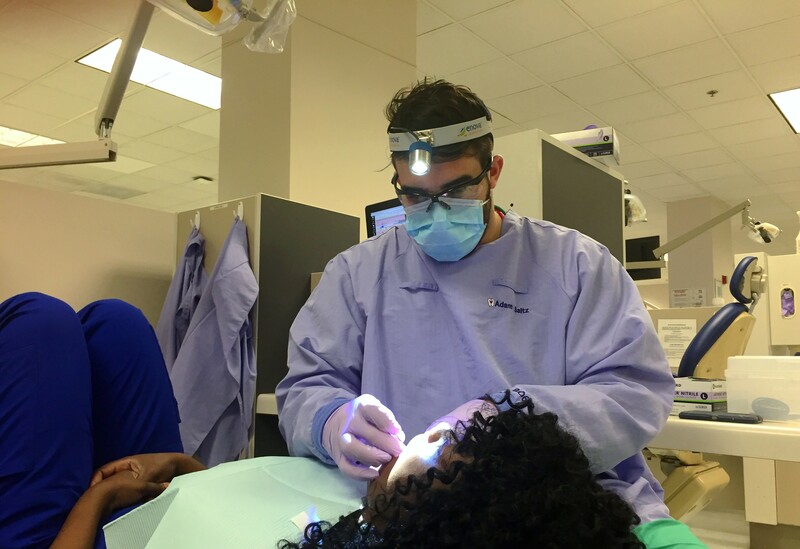 We caught up with Adam to learn more about using surgical headlights in dental school and his plans as he approaches graduation. Shedding Light: Where do you attend dental school and what motivated you to enter the dental profession? Adam Saltz: I’m a fourth-year dental student at Nova Southeastern University (NSU) College of Dental Medicine in Fort Lauderdale, Florida. I recently completed my Master of Public Health (MPH) degree from NSU’s College of Osteopathic Medicine, while in dental school. I’ve long had an interest in health and wellness. My father is a general dentist in Maine, and he has greatly shaped my academic and professional paths. I aspire to balance work, family and the leadership roles that he so well has over the years. This summer, I’m applying to residency programs in periodontics, which best bridges oral health and medicine. As a periodontist, I can provide total body wellness to my patients through educational strategies and surgical interventions. Shedding Light: You just graduated with an MPH. Why did you choose to study public health? Adam Saltz: I had a front row seat to dental community outreach in high school. My father co-chaired a service event called Dentists Who Care for ME, which annually provides free dental care to uninsured and low-income families throughout Maine. Early on, I saw the transformative role of public health in improving access and affordability to care. I wondered if there was some way to pursue those relations further in my education. When I came to NSU, as part of a seven-year, dual admissions dental program, I learned of Give Kids A Smile (GKAS). Each year, the American Dental Association (ADA) Foundation hosts 1,500 programs nationwide that provide free dental care and education to uninsured children. I immediately saw parallels between this and my father’s event. I wanted to help my new community in South Florida and began promoting oral hygiene as a tooth mascot for NSU’s GKAS in undergrad. In my first year of dental school, I served as class representative and was appointed to the team of program directors. The next two years, I would help lead NSU’s GKAS to win the ADA Foundation E. “Bud” Tarrson Award, NSU’s Graduate Organization of the Year, and the national kickoff site for 2016. This year, we provided comprehensive treatment and preventive education to 700 children and donated more than $225,000 in free dental services. 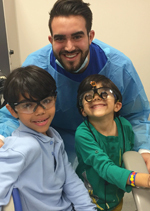 NSU’s GKAS proudly represents one of the largest pro-bono pediatric dental efforts. The growth and success of this program is attributed to its leadership and school-wide support from students, faculty, staff and administration. We constantly seek to reinvent and expand the way we deliver healthcare to our patients. This year, as the nation’s first interprofessional GKAS, NSU medical students provided in-depth nutritional counseling to all of our participants through interactive games. We structure our program to groom and excite future leaders, so incoming students can continue to improve community health. Having finished my MPH program, I now have the knowledge and credibility to incorporate these efforts into my dental career as an educator, specialist and humanitarian. Shedding Light: You are now the proud owner of an Enova Cyclops XLT-125! How does it compare to what you had to purchase when you started dental school? Adam Saltz: I’m very excited about the new headlight! I don’t have to wait until residency to start using it either. I had the incredible fortune of being five students selected for NSU’s Periodontics Honors Program, where I will be performing a variety of periodontal surgeries. The light will be put to good use during my crown lengthening, mucogingival, osseous and site development procedures. When I started dental school, I purchased an LED headlight. But, I can already tell the difference with the XLT-125. The XLT-125 feels great! It’s lightweight, comfortable, and the battery lasts all day, which is great for a student who is always on the move in clinic. In surgery especially, I need to clearly see the difference between intraoral hard and soft tissues, and this headlight truly delivers. There’s also a “cool” factor to the XLT-125. One of my professors commented about what a “game changer” the headlight is, and I couldn’t agree more. Shedding Light: What’s next for you? Adam Saltz: As an applicant this summer, I’m waiting to hear from three-year periodontics residency programs. This year, I will finish my term as editor-in-chief for the American Student Dental Association, which will conclude an exciting four years involved in organized dentistry as a student. I was recently named a national ambassador for GKAS and will be attending the ADA Foundation’s Leadership Institute this fall as a participant and educator. I hope to give back to GKAS all that it has given me. After my specialty training, I hope to eventually practice in the Greater Portland Area. The six years I’ve spent in sunny Florida still couldn’t deter me from the New England winters. I hope to apply my background in dentistry and public health to positively impact entire communities. As a leader in organized dentistry and hopefully periodontics, I look forward to the potential of improving the way patients receive and afford oral healthcare through a greater awareness of the mouth-body connection. Note: Enova offers discounted prices to dental/medical residents. Residents who are in their residency or who have graduated within the last three months may purchase new or used Enova LED surgical headlight systems in excellent condition for up to 30% off list prices (up to $990 savings). Each Enova LED surgical headlight system includes the LED surgical headlight, a digital battery pack, a charger, accessories, and a carrying case. All Enova headlights come with a 30-day money-back guarantee. Learn more.